Haitelenisia Maka and Sapapali’i Ah Lin prepare for the karanga. 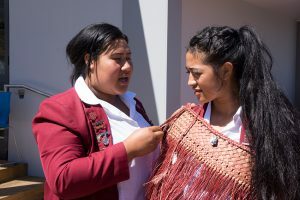 On a bright sunny afternoon, Friday 3 March, Sacred Heart College, Napier, students and staff were full of pride and excitement as they hosted guests at the blessing and official opening of their new Mission Centre building. 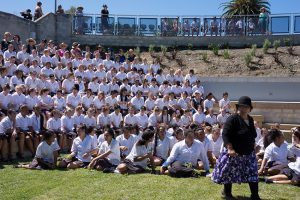 After waiting a long time for a new spiritual centre and a culmination of more than two years work, the indoor-outdoor Mission Centre will now serve both the cultural and spiritual needs of the staff and students. 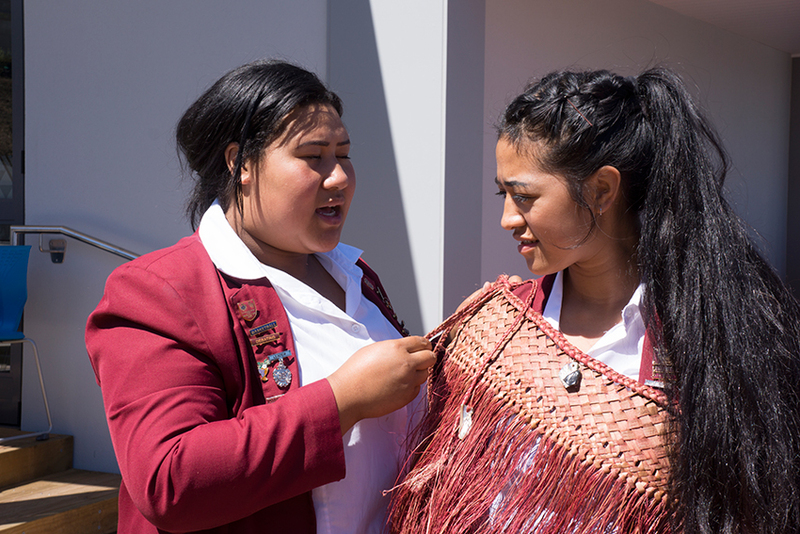 The Mission Centre building stood as the perfect setting for the coming together of this historic school community. 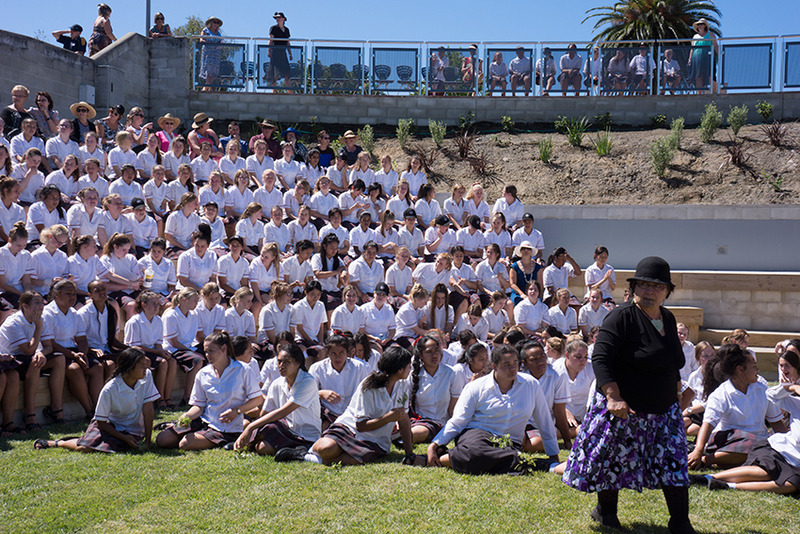 Whaea Stewart led the official guests onto the site with the support of students giving a karanga and a conch call. Amanda Aarons, Board of Trustees chair, formally welcomed guests on behalf of the Board of Trustees. Principal Steve Bryan described the centre’s history, founded originally by the Sisters of Our Lady of the Missions on the Napier hill-site overlooking the ocean. 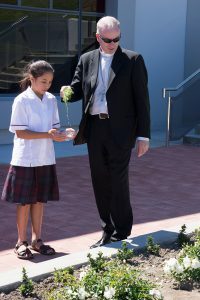 Bishop Charles Drennan blessed the Mission Centre and its surrounding grounds. Chair Amanda Aarons said, ‘Our sincere gratitude to all of you for being here and for the parts you played in the construction of our beautiful new building. The Board recognises how fortunate we have been; our College has benefited dramatically from the hard work of so many of you. ‘As we look forward to next year’s celebration of Sacred Heart College’s 150 year anniversary, the Mission Centre stands as a symbol of both the exciting new and as yet unchartered future of the College while reminding us of how the Sisters’ original call to mission brought them to this beautiful and very special place on the hill. Principal Steve Bryan spoke about the centre’s history and development. ‘In 2001 a devastating fire destroyed the Sisters of Our Lady of the Missions convent and chapel on the site. It marked the end of their residency on the hill and their place of prayer and worship. They had been here since the 19th century, settling not long after arriving from France in 1865. ‘Following the fire, a hall attached to the hostel was converted into our cultural centre, dubbed for 14 years as our ‘sacred space’. Today this new Mission Centre will serve both the spiritual and cultural needs of our staff and students. 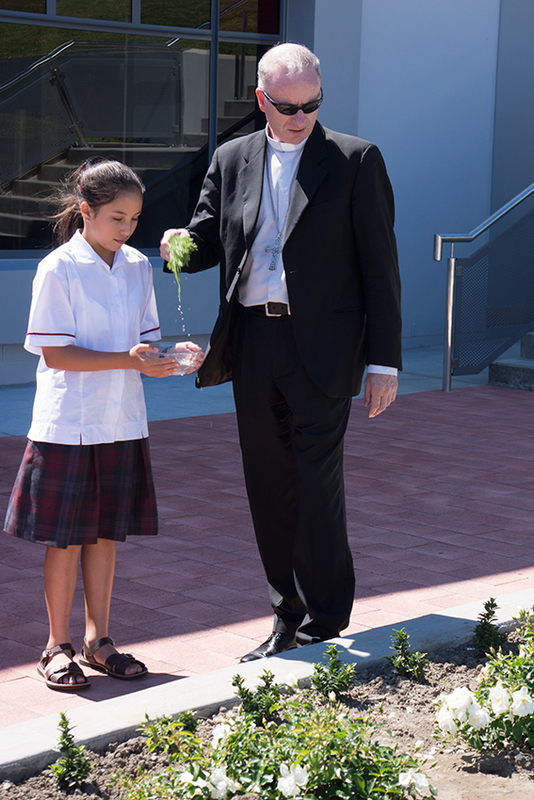 Youngest student Lara Turnbull with Bishop Charles Drennan. Guests included: Bishop Charles; Sr Anne Sklenners, co-ordinator for the Consolidated Mission Fund for the RNDM Province of New Zealand, Mission Sisters; Fr Peter Head, parish priest of the Catholic Parish of Napier; other Napier priests; Deputy Mayor for Napier, Faye White; members of the Palmerston North Diocese team who provided much of the funding for the new multi-million dollar centre – Tony Murphy, Finance Manager and Chair of the Proprietor’s Trust Board who initiated the project, Lynette Roberts-King, Manager for Catholic Schools, and Property Manager, Corinne Richdale; Raj Patel, Gerald Cogan and James Cross of BSM Group Architects; Nick McCann of GEMCO Engineering; Nick Ward, project manager; schools from the Catholic community; current trustees; members of the PTA; past pupils; former trustees and board chairs; former staff and principals; and local media.